Over the last several posts, I have tried to analyze some of the characters of Pilgrim’s Progress that was written by John Bunyan in 1678. We have visited with Ignorance, Evangelist, Mr. Worldly Wiseman, Valiant for Truth, and Mr. Fearing. These travelers will be ones that we meet along the way in our trek toward the Celestial City. Bunyan’s observations of people in the 17th century still hold true for much of what we see in our times as well. You can see for yourself that these people along the way very much fit into the category of Ella Wheeler Wilcox’s poem about being a lifter or a leaner. A lifter is someone who makes deposits of encouragement and hope into your life. A leaner is one who great withdrawals and they will do so until you are literally sapped of emotional and spiritual strength. Great Heart falls into the category of a man who was not just a lifter, he was a very heavy lifter. He fills the role of a pastor whose calling and job it is to guide pilgrims to the shore of the river crossing that will lead to the Celestial City. He is a man who represents to us the hard work and necessary discipline that is required to do this great job. There are some other pastors that Bunyan writes into the story as well. Obviously, Evangelist fits the role of a pastor and he appears all throughout the life of Christian but there are specifically four others besides Evangelist and Great Heart. Their names are Knowledge, Experience, Watchful, and Desire. These four keep their watch from the mountain tops in the steep ranges where sheep are cared for in the pastures. They care for the flocks and help the pilgrims primarily in two ways. They use the alternating tools of hope and fear as they lead their charges. They speak of hope when they mention the end of the destination that will have great glory. They sometimes resort to using fear by warning of some well laid temptation will lead them to turning back to the cities and towns they came from. Pastoral ministry in our day has never been more critically needed because of the great spiritual and moral drift and dire need for revival. There are Great Hearts scattered all over God’s Kingdom who are literally carrying entire churches on their shoulders. It is only in their absence that one really senses how important they are to us. 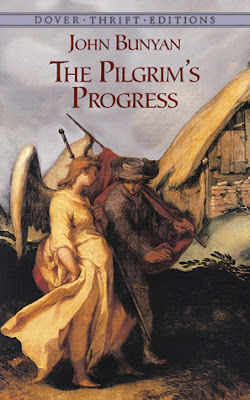 To revisit Pilgrim’sProgress over the last couple of weeks has been a wonderful experience. In one of the previous posts, I mentioned that I had originally been introduced to this fine book by Pastor John Harrell in Bridge City, Texas. For years in Bridge City, the church has been shepherded by Brother Harrell’s preaching and praying and woven all through those years were numerous illustrations that he would pull from this book and masterfully use them in his sermons. 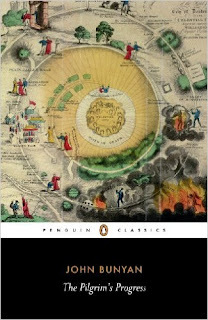 If you have never read Pilgrim’s Progress, my question is this: What doth hinder thee? Perhaps that is a humorous way to express it but in all seriousness, the book opens up the mind an awareness that human behavior is no different in the 1600’s than it is in 2017. 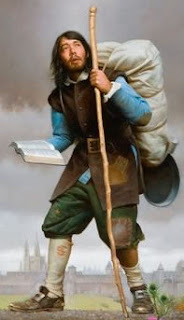 There are aspects of John Bunyan’s famous allegory Pilgrim’s Progress that have more details as you read on through the second portion of it concerning Christian’s wife and children who flee from the City of Destruction. As their story unfolds, we read about some events that Christian went through but is not as detailed in the first half of the story as he is relating a first person account. The story told by one of those characters in the second half is who I want us to visit with now. The character is Valiant for Truth. What a powerful name that Bunyan picks out for this young man, this young soldier, this young minister. Bunyan is playing off Jeremiah 9:3 where the weeping prophet notes that there are some who aren’t valiant for the truth. One of the chief characteristics of John Bunyan is pointed out by Charles Spurgeon and it is observed very clearly in this segment of the allegory. Spurgeon noted that in reading all of Bunyan’s works and actually having read Pilgrim’s Progress more than 100 times, he said that when you read Bunyan, “he bleeds bibline.” That means that his writings are so loaded with Scripture that you cannot help but notice how familiar that Bunyan is with the Word and he brings forth its application to us in a very helpful way. John Bunyan’s famous allegory Pilgrim’s Progress is filled with men and women who happened along the path of Christian as he has started his journey toward the Celestial City. We have spent a little time with Ignorance who wanted to talk Christian into trying to make the journey on his own works. Evangelist is another character who was very instrumental in the conversion and later the discipleship of Christian. He is representative of a faithful godly pastor who spends time and effort working with the travelers as they labor through the journey. We now come to another impediment, another character, who will serve as an agent of Satan to hinder the pilgrim’s progress. Mr. Worldly Wiseman is a convoluted but very brilliant soul. His brilliance rivals that of Ignorance who was just as polished and shameful except Mr. Worldly Wiseman is an older gentleman who has been around the world for a while and knows the general thoughts and doubts of the travelers. Returning to John Bunyan’s Pilgrim’s Progress, I want to look at another one of his characters. This book over the years has been one I return to regularly and read various scenes from because even though it was written in 1678 still has a profound grip on presenting human behavior in an incredible way. It was recommended to me by Brother Harrell in Bridge City a number of years ago. It is rare to dig into this allegory about a man on a path toward the Celestial City and not come away with some spiritual benefit. The next character to assess is a man named Evangelist. This character shows us the impact that a godly pastor/preacher/teacher can have on one traveling the Christian path. It is compelling how that Bunyan begins the book by telling us that it is a story of a man who is walking through the wilderness of this world. If ever there were a phrase that could sum up what we are doing as we walk out the Christian life, it would certainly have to be admitted that we are in the wilderness—morally, spiritually, mentally, and emotionally. While there are some who looking for all manner of solutions to save the world, the society, the environment from whatever deadly challenge it is facing, there is only one solution—to be born again. 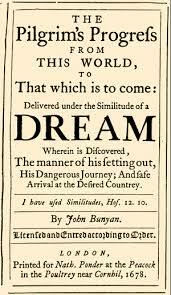 It has been a long while since I have written anything about John Bunyan’s Pilgrim’s Progress. 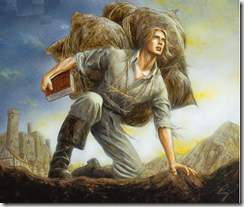 I can still remember 15 years ago, or more that Brother John Harrell, long-time pastor of Bridge City UPC, recommended that I read dig into that allegory. He told me that it was loaded with sermon thoughts and illustrations and profitable spiritual motivation. I have written in the past about Brother Harrell and the uniqueness by which he would weave the Pilgrim’s Progress into his sermons. 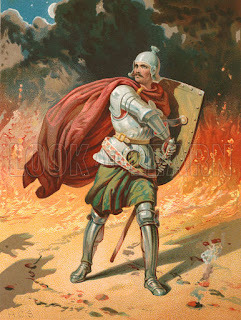 As I started reading Bunyan, it led me to another allegory he wrote, The Holy War, which had some excellent contributions to make as well about convictional preaching. I have explored some themes from that book as well in the past on this blog (Part 1, Part 2, Part 3, Part4, Part 5). I would be remiss a well if I didn’t mention Paula Thompson, aka The Tape Lady, who worked for years as the one who put together the cassette tapes and later the CD’s of Brother Harrell’s preaching to be mailed all over the US. So many preachers and saints benefited from the preaching that came out of Bridge City during that time and while she has passed on from this life, I truly believe her reward of service in this way is very great. But as I thought on the Pilgrim’s Progress, I began to mull over some of the characters that Christian ran into along his way to the Celestial City. These characters are multi-faceted and are pulled from sidewalks and alleys of every single person’s life who has ever walked this Christian path.